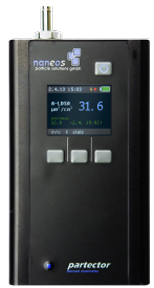 The Swiss made Naneos Partector is the world's smallest nanoparticle detector and is now being offered in the Americas through CH Technologies (USA) Inc. It is based on a novel non-contact electrical detection principle which needs nearly no maintenance. For nanoparticles, it measures lung deposited surface area (LDSA), a metric typically associated with adverse effects on respiratory health.